The Ordnance Survey Memoirs of 1834 record this hill as Donalds Hill or Knocknahurkle (OSM, ix, 34). Séamas Ó Ceallaigh derives this from something like Cnoc na hEarcola in his comments on the Topographical Fragments in the Franciscan Library. 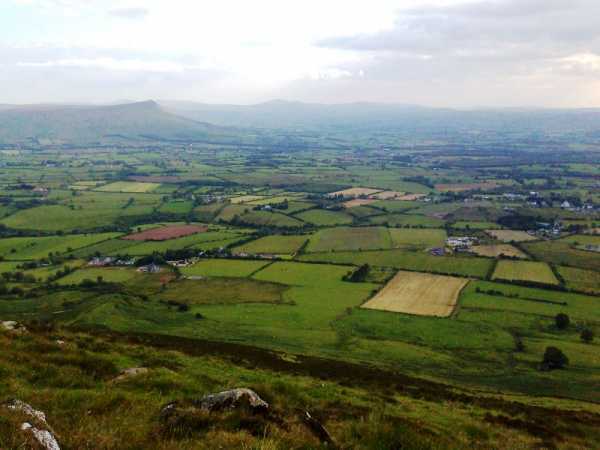 Donald's Hill is the highest hill in the Keenaght area and the 955th highest in Ireland. Donald's Hill is the most easterly in the Keenaght area. I passed Donald's Hill on the way home from a recent trip to Donegal and decided to bag it whilst in the area. I approached from the NE via the Temain road and parked up at the gate mentioned by Harry Goodman (752185 B). I was heartened by his comment that there was a raised track all the way to the summit and as it looked quite close I thought I could maybe get away with a quick visit. I made good progress down this track for a good 700m until to my dismay the track disappeared into the surrounding terrain. Now I had to face another 700m of bog, deep heather, drainage ditches and energy-sapping long grass all the way to the summit which was a bit of a misery. With no obvious path I headed straight for a fence line which gets close to the final raised area up to the 399m summit. Thankfully the summit itself is quite dry with a couple of rocks to stand on. In contrast to the unpleasant climb the views from Donald's Hill are very good indeed, its isolation from other hills giving it a fine panorama. There is a great view into Donegal with the Derryveaghs and Inishowen hills very prominent. There was an interesting visual effect where the huge bulk of Muckish sat directly in line behind Loughsalt Mountain almost like a silhouette. Benbradagh and the higher Sperrins lie to the SW - Sawel looks very high from this direction. Carntogher unfortunately blocks the view to the Mournes but the whole length of the Antrim hills from Divis to Knocklayd is easily visible. It was a very clear evening and looking to the left of Knocklayd I could make out the hills of Kintyre but then was shocked to see the Paps of Jura crisply defined against the evening sky, visible at a distance of almost 115km. The long views held my attention for some time until I decided to return to the car through the tough terrain.